Sorry but it looks like some of the things I wanted to insert didn’t stay inserted. Live and learn with this blogging thing! 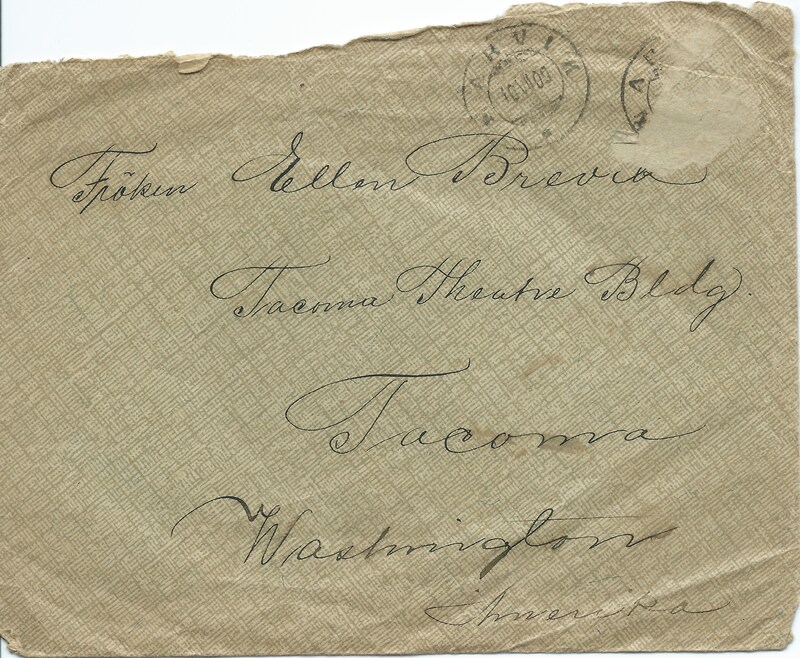 A 114 year old letter….Among the Ella Papers are hundreds of letters. Some in English and some in Norwegian. We are lucky to have a wonderful Norwegian translator, Silje (like Celia), who is a friend of my niece, Laura. They both live in Long Beach. I am scanning the Norwegian letters and emailing them to Silje. And she has finished two of them in short order! Tusen takk, Silje. The letter is dated 6 July 1909. They often used paper that was 8¾ “ by 11½ “. They folded it in half the long way and wrote with the fold on the left, then wrote on each side of the inside in columns and then on the remaining blank side. Here’s the front of the letter. Isn’t her handwriting beautiful? This was from a cousin named Edom or Edoni-–probably one of the family that Ella lived with in Narvik. The mother she refers to is probably Ella’s Aunt Anna, her father’s sister. And from the letter, we learn that Ella traveled to America via Liverpool, New York and Chicago. Thanks for the letter from the 12th of last month. I am happy to hear that you now have happily arrived and that you are doing well and enjoy yourself, as well as that your siblings are healthy, all of them. I have also received the postcards from Liverpool and New York and Chicago, and I would have sent you postcards to those places, but I didn’t know an address where I could reach you. I did send a postcard to Liverpool, but I don’t know if you received it before you left England. I received a letter from mother yesterday. She feels a little better, but it won’t help much if the arthritis doesn’t get better. Unfortunately, we haven’t had any summer until the last couple of days. Yesterday and today were very hot, 33 – 34 degrees Celsius (91 – 94 F), and now it looks like we will be getting some summer weather. Over there, where you are, I bet there is great summer weather. My position just got permanent from July 1st, so the salary is a little better, and I don’t have to work nights all the time, neither holidays. Now I’ve only got every fourth night. Now I have paid about half of what I owed when you left, so next month I will probably be debt free. I still have not found another apartment, but I am renting out the living room and kitchen to two sewing ladies from Hammerø, so now I’ve only got the bedroom to myself, and as soon as I find a comfortable apartment, I will rent it, because I am tired of living there. The house you live in over there is beautiful. What kind of business is the man doing, that you live with? You also have to tell me what your brothers are up to when you write me back. You asked about “Mons” (sp? Probably a cat). Unfortunately, I don’t know myself where he is, or whether he is dead or alive. He disappeared last month, and I have searched for him all over the city, but not seen any signs of him. I guess someone shot him. Anna from Melsbø has not been here yet, so I haven’t gotten the box you know shipped yet. Neither have I seen anybody else from there, so I don’t know how they are doing there now, but as soon as someone arrives from there, I will ship the box. Now I will write mom and send money and half a bag of German potatoes, since they’re out of potatoes in Maalø. Last month I sent a whole lot of groceries, so she shouldn’t be doing too bad where she is. I assume she will stay until at least August. I don’t have any other news to tell this time, but I will soon write again, and then you’ll know what’s new. I almost forgot! I have to thank you for the photograph you promised me. I hope I receive it soon. When I can afford a new uniform, I will get a photo of me and send it to both you and Hanna. I actually owe Hanna one already. Now I have to stop for now with a wish that both you and your siblings will be doing well always. Best regards, and tell all your siblings hello from your cousin. Write back soon. I remember hearing that Ella and Johanna were maids to the manager of the theater. 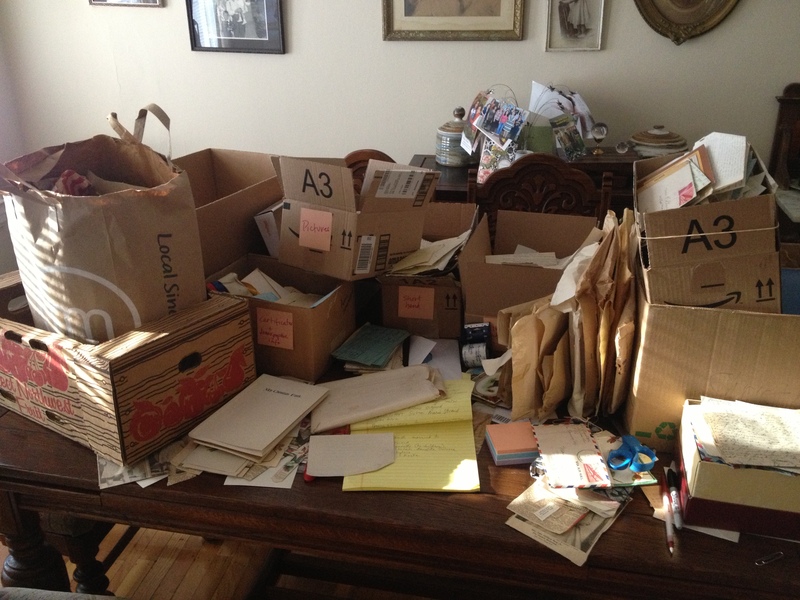 In April of 2013 I brought home the contents of my grandmother, Ella Dorothea Brevick Strand’s trunk, which filled about 5 medium sized cardboard boxes. She was an almost daily diary writer. She wrote in notebooks and on separate sheets of paper, or on the insides of envelopes if she didn’t have writing paper available. She also saved every letter she ever got. Thankfully a great deal of the papers were saved, she wrote very legibly and learned English very quickly. 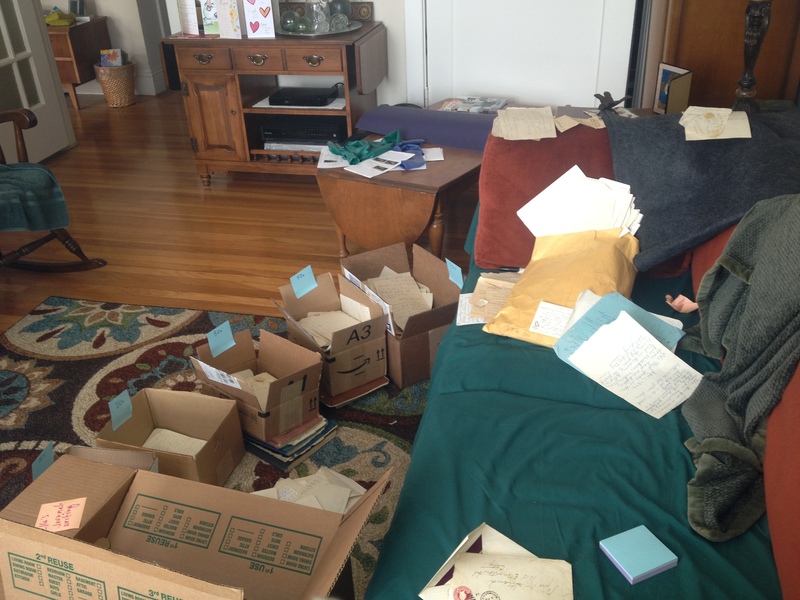 Here is the living room work station where I sorted, by decades, the hundreds of letters she received over the years. And these are just the ones in English! She wrote in English, Norwegian and in Pitman shorthand. Anybody know Pitman? There were also many photographs in among the stuff. Even the children’s report cards! She also saved newspaper clippings of friends and family weddings and funerals and 25th or 50th wedding anniversary parties. And she saved clippings of the Kennedy’s and the early space shots. (Copies of examples at a later date.) She was very interested in national and international events. A brief biography: Ella Dorothea Brevick was born in Hemnesbjerget, Norway on October 4, 1893. Because her mother, Ida Elisa Anker Larsen, died when Ella was around 5 years old, she and her younger sister, Johanna Helena Brevick, were farmed out to other family members. Ella went to live with her father’s sister, Anna, in Narvik, Norway, above the Arctic Circle. In 1909, Ella immigrated to the United States, eventually settling in Tacoma WA where she lived with all her brothers and sisters. She met her husband to be, Knute Martinus Strand, on Fox Island, near Tacoma. They married on September 5, 1915 and had six children, Karl (my father), Irene Marian who died at age 10 months of influenza, Robert, Dorothy, Norman and Marie. Ella died on June 3, 1991 after a long illness and a long life. Just a year ago today and it seems as if I had known him for several years. I have never told much about him nor what I thought of him myself so therefore I shall write and tell what I think of him. My regard for him has grown higher and higher since one time we had a kind of misunderstanding. He is a good and industrious boy who does the best he can and is not afraid of work. He is also kind and sociable to other people as I can see from being with him on different occasion. Last Sunday I felt so proud of calling him my sweetheart, such admiration as I had hardly felt before. 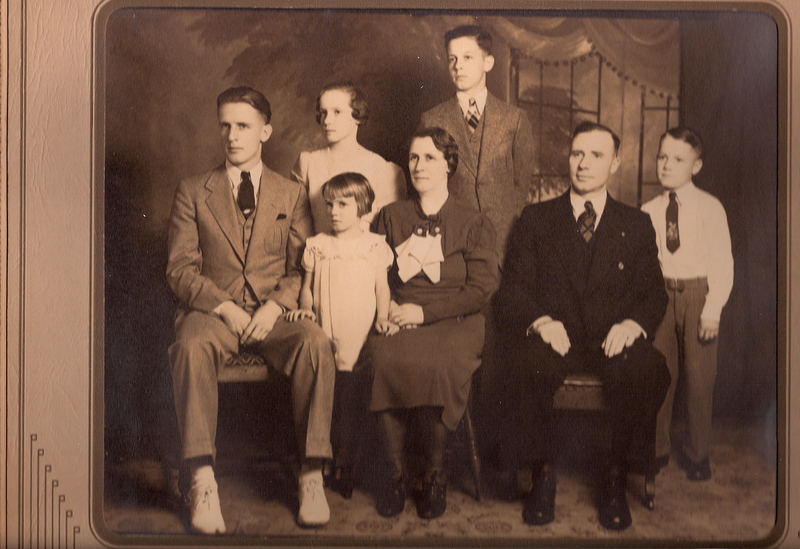 Left to right: Karl, Marie (below), Dorothy (above), Ella, Robert, Knute and Norman. This is an amazing collection information about an amazing person who felt compelled to write it all down and we are so fortunate it has been preserved. I hope that someday it can become a book but in the meantime I am transcribing it into WORD documents and will get information out to interested family members and friends as I go via this blog. Please share your memories and photos too.